The 2018 Winter Olympics in PyeongChang, South Korea kicks off with the opening ceremony on Friday, February 9th at 5:00am CST. The games are set to run 16 days until closing ceremonies on February 25th. The games unofficially began with the torch relay that started in Greece on October 24, 2017. The relay entered South Korea on November 1, 2017. It will have lasted 101 days once it reaches PyeongChang. 7,500 torch bearers participated in the relay to represent the 75 million people of Korea. The 2018 Winter Olympics will feature 102 events. It will be the first Winter Olympics to have over 100 medal events. Four new disciplines were introduced to the Winter Olympics in Pyeongchang. Big air snowboarding, mixed doubles curling, mass start speed skating, and mixed team alpine skiing join the 15 sporting events from previous Olympics. A total of 95 teams have qualified at least one athlete. Of those teams, 92 are expected to compete. Six nations are scheduled to make their Winter Olympics debut. Kosovo, Ecuador, Nigeria, Eritrea, Malaysia, and Singapore enter their first Winter Olympics. 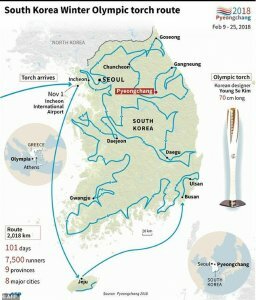 North and South Korea have reached an agreement to let North Korea’s qualified athletes across the demilitarized zone into South Korea to compete in the games. The two countries will march together in the opening ceremony under the Korean Unification Flag. The women’s ice hockey team will compete as a Unified Korea. In all other sports, there will be a North Korea team and a separate South Korea team. The Russian Olympic team was banned by the International Olympic Committee after the Russian doping controversy. If individual athletes who qualified and can demonstrate they have complied with the IOC’s doping regulations, they may compete as “Olympic Athletes from Russia” (OAR) under a neutral flag and with the Olympic anthem played in any ceremony. It is still unclear how many athletes will be competing as OAR’s. The 2018 U.S. Olympic Team is comprised of 244 athletes (135 men, 109 women). Four athletes, including three Olympic medalists, make up this year’s women’s bobsled team. They won two medals in Sochi, one silver, one bronze. A figure skating veteran at 28, Rippon made history simply by making the team. He’s the first openly gay American to qualify for the Winter Olympics. Men’s singles figure skating team. He made his senior international debut last year. Figure skating. She is only the second American woman to land a triple axel in competition. The 18 year old won the U.S. Figure Skating Championships in 2017. Figure skater who stunningly skated her way past the competition at the 2018 National Championships, taking home the gold. Sibling skaters! Together, they’ve won three World Championships medals. Ice dancers Bates and Chock have won two World Championship medals and will compete to add an Olympic one to their collection. White has competed and excelled in three Olympic Games as a snowboarder. Freestyle skier who has won gold at the X Games three times, took home a bronze medal in Sochi. In Sochi, Anderson won the gold medal in the slopestyle event — the first of its kind at the Olympics. The cross-country skier, will compete at her fourth Olympic games in 2018 for the chance at her first medal. Argueablly the worlds best female alpine ski racer. Four time Olympian, returning to Alpine skiing after devasting injuries kept her out of the Sochi Olympics. The snowboarder ha been to every Olympics since 2002 and won a medal 3 times. A silver medalist in freestyle skiing. This is the 17-year-old’s first time at the Olympics — and she’s a favorite to bring home a snowboarding medal. The curling siblings will compete not only with the men’s and women’s teams, but together in the mixed doubles competition. Decker, Knight and Lamoureux-Davidson are three U.S. hockey veterans who took home silver medals in Vancouver and Sochi. 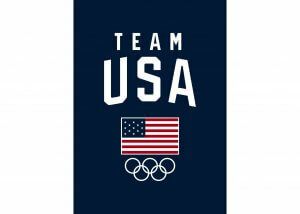 In the United States, the Games will be broadcasted by NBC. The Olympic Games will be broadcast on various NBC networks. NBC will present 176 hours of live coverage beginning on Thursday, Feb. 8, at 7 p.m. CT, and concludes with the Closing Ceremony. NBCSN will present 10 days of 24-hour coverage from Feb. 18-25. The Pyeongchang Games officially begin on NBCSN on Wednesday Feb. 7 at 10 p.m. CT, with live coverage of mixed doubles curling. CNBC will present 46 hours of coverage, including its curling telecasts beginning Monday, Feb. 12 and concluding Friday, Feb. 23. USA Network will present 40.5 hours of ice hockey and curling coverage, 6-8:30 a.m. CT. Coverage begins on Saturday, Feb. 10 with a live presentation of the Women’s hockey qualifying round.